I've been making lots of progress on my quilts lately. I am happy to say that I finally finished the top of my One Block Wonder quilt! I'm very happy with how it has turned out! This is my second time doing mitered borders and I still don't really feel like my method is precise enough--I find it difficult to get the accent strips to line up neatly at the corners and it seems to be magic or luck when they do. I have been searching the Internet and books for more accurate ways to do this next time. If you have recommendations, please leave a comment! So I'm going to take a little vacation from it while I think about how I want to quilt it. I'd really like to have this finished before classes start again in late August. I've got a few larger Christmas gifts I'm working on, including this one, and having them mostly finished before I go back to teaching would be wonderful! I've also finally gotten the first border on my Cracked Pots quilt. This quilt really stalled for a while because my quarter square triangles were not precise enough--the points didn't match up and three of the four border strips were half an inch too long! I tried doing square in a square blocks instead and that was worse! 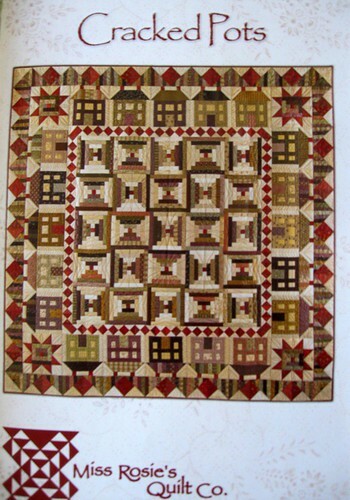 I spent hours pouring over Harriet Hargrave's series of quilting books (Freshman Year, Sophomore Year, Junior Year, etc.) trying to improve my technique (and she doesn't get to triangles until the junior year!). I considered eliminating this border altogether. I let this sit for quite a while and then decided I was ready to deal with it. Kim suggested I just sew some of the seams a bit deeper to shorten the too long borders. She's a genius! 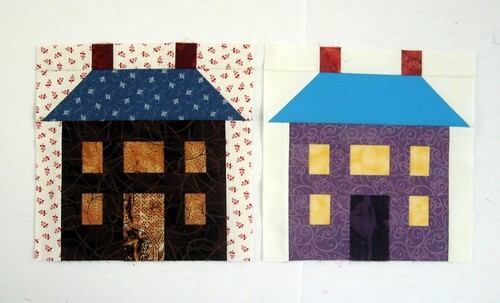 Now I've started the borders for round two: houses. I was considering just doing a house in each corner instead of all around, but my quilting buddies on flickr gently suggested that this was perhaps not the best option. Here's a view of what the pattern is supposed to look like. 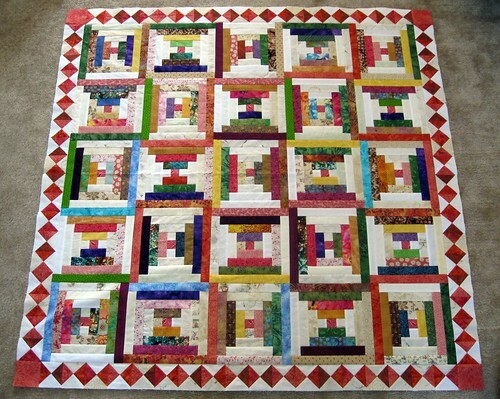 I guess I'm thinking that I'll follow the pattern for this second border but I think I'll skip the third pieced border. 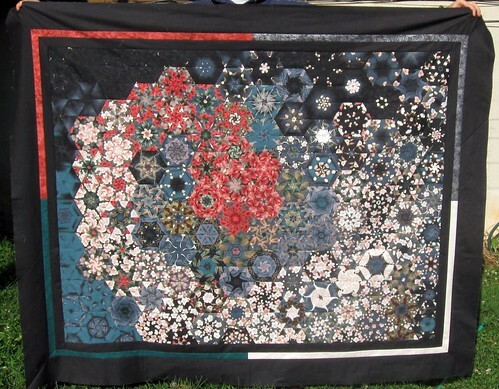 This quilt is another Christmas gift. 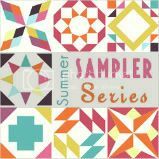 I joined the Summer Sampler Series Quilt Along on flickr run by three very nice quilters: Katie of Swim, Bike, Quilt, Faith of Fresh Lemons Quilts, and Lee of Freshly Pieced. Each week, each of them posts one block with a tutorial on how to make the block. I started with this photo as my color palette inspiration and worked from there. Kim, again so helpful, helped me choose some fabrics. They're a little out of my comfort zone but I really needed some bright, bold colors after working with all that black on the One Block Wonder. So that's pretty much what I've been up to lately. The only other thing is a class I've been taking on making lemoyne stars. I'll have to post a photo once I get a star finished. I'm thinking of maybe making a Christmas table runner or wall hanging out of it.